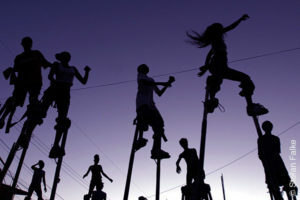 During this session we will be going over the basics of how to start stilt walking. We will be learning how to fall, how to dress your legs, how to spot another stilt walker and how to balance on your own stilts. We use drywall stilts, peg leg stilts and jumping stilts. Bringing a friend is welcomed for spotting.